NH sea-ice 27 day lunar cycle? Published January 22, 2014 at 640 × 384 in NH sea-ice 27 day lunar cycle? 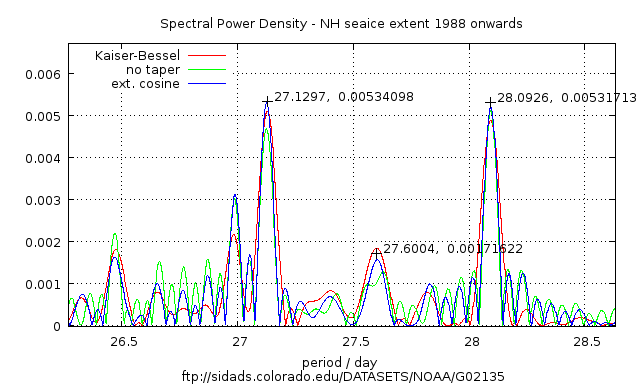 Spectral power density of northern hemisphere sea ice extent. NOAA sea ice extent data was used from 1988 onwards. This subset was used due to platform changes. Earlier data had fewer orbits per day, some notable breaks in coverage and was obviously not homogeneous with the period used. The data are provided with daily dates. These were converted to floating point Julian day format for processing. To avoid loss of resolution and precision in the FFT processing, the data were high-pass filtered with a 260 day Lanczos filter to concentrate on the sub-annual signal. Several different taper functions ( including no taper ) were used to determine whether the results may be caused or distortion by the taper windowing operation. It was also found that removing the auto-regression by analysing the first difference of the daily data( rate of change ) gave more consistent results. This detailed segment of the Arctic sea ice spectrum shows evidence of the anomalistic lunar month ( the cyclic variation in the Earth-moon distance that determines the magnitude of the tidal force ). Annotated values are approximate cursor values. Calculated values were determined at higher resolution. A highly symmetrical triplet  is noted indicating an amplitude modulation of the monthly cycle by a longer term variation of about 4.31 years. The triplet is highly symmetrical in both frequency interval and side-lobe amplitude and the combined power of the three peaks makes it significantly stronger than the surrounding noise floor.